Walking, running, and cycling are great ways to relax, enjoy the outdoors, and see many spectacular views of Rosslyn. Pedestrians always have to the right-of-way on sidewalks and multi-user paths. Cyclists should always use great caution around pedestrians. At the same time, when you are out walking, lessening your risk of heart attacks, stress, and many other illnesses, some awareness of potential hazards from cyclists can lessen the small risks of a serious accident. Walking as far to the right on the path as is feasible ensures that any traffic passing you will be passing you on your left. Cyclists passing you should always give an audible signal. If you hear such a signal behind you, and you see a bike on the path ahead coming toward you, that's a good time to just step to the right off the path. That will help to ensure that both cyclists see each other and don't have a head-on collision. You don't have to do that. Don't do it if you have balance problems and doing so would cause you a risk of a fall. But if you can do it, it's a nice thing to do. Cyclists have to be very wary of obstructed vision. Particularly when looking up paths or across roads, the mind tends to interpolate empty space for obstructed portions of view. So don't trust an obstructed view that appears clear. Always look for an unobstructed view showing a clear path. One of the multi-user paths that deserves the most caution is the path along 110 connecting downtown Rosslyn to Rosslyn's Arlington National Cemetery. Hills and curves at both ends of the path create risks. In addition, the path has a kink around a tree in the middle. As always, pedestrians have the right of way. 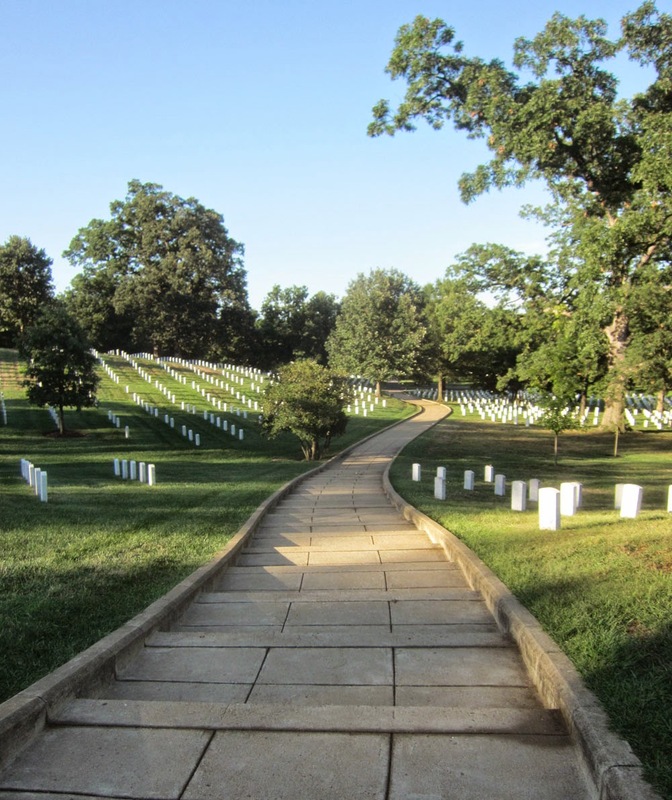 But if you're walking, a great choice is to enjoy a scenic walk through Rosslyn's Arlington National Cemetery rather than walking on the path along 110. Cyclists and runners are not allowed along the cemetery path. The cemetery path is quite, peaceful, and beautiful. It's only a few hundred yards longer than the 110 path. If you're walking, the cemetery path is a great choice. 1) Be careful or you may end up here sooner than expected. 2) Enjoy every day because someday you will end up here.